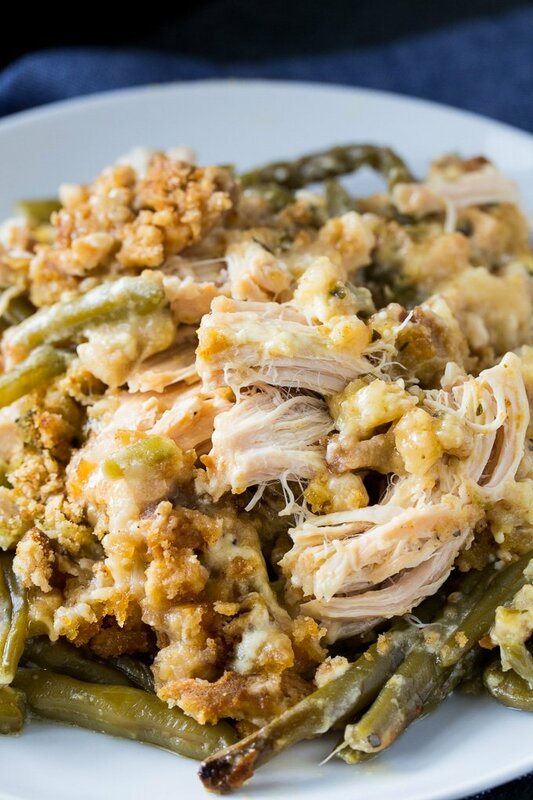 Only 5 minutes of prep needed for this amazing Crock Pot Chicken and Stuffing with Green Beans. 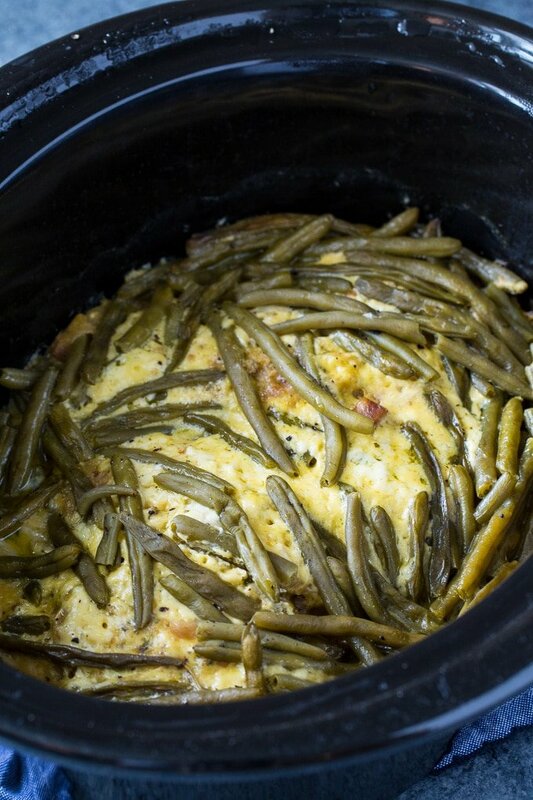 Then 4 hours on HIGH in the slow cooker and you have yourself a hot and comforting one dish meal. It’s a meal with all the flavors of Thanksgiving but none of the effort. 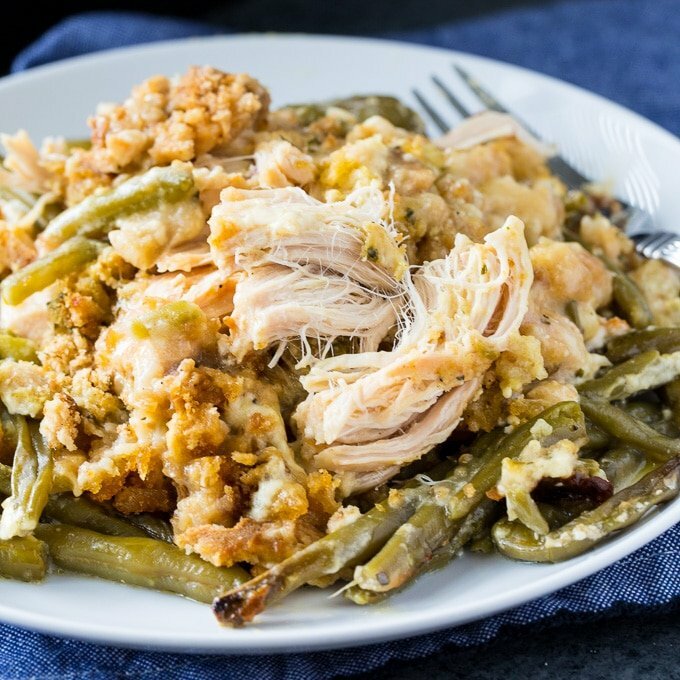 To make Crock Pot Chicken and Stuffing with Green Beans, season 3 boneless, skinless chicken breasts with salt and pepper and place them in a lightly greased 6-quart slow cooker. Pour a box of dry stovetop stuffing (just the mix- DO NOT add anything to it) on top of the chicken. In a bowl, whisk together 1/2 cup of sour cream, 1/4 cup mayonnaise, 1/3 cup water, and a can of condensed cream of chicken soup. Spread the mixture on top of the dry stuffing. If you wish, you can leave out the mayonnaise and add 3/4 cup sour cream, but I like the way the combo of the two works together. Scatter a bag of frozen green beans on top and season them with salt and pepper. Cook on HIGH for 4 hours and it’s ready to dish up. Couldn’t be easier! 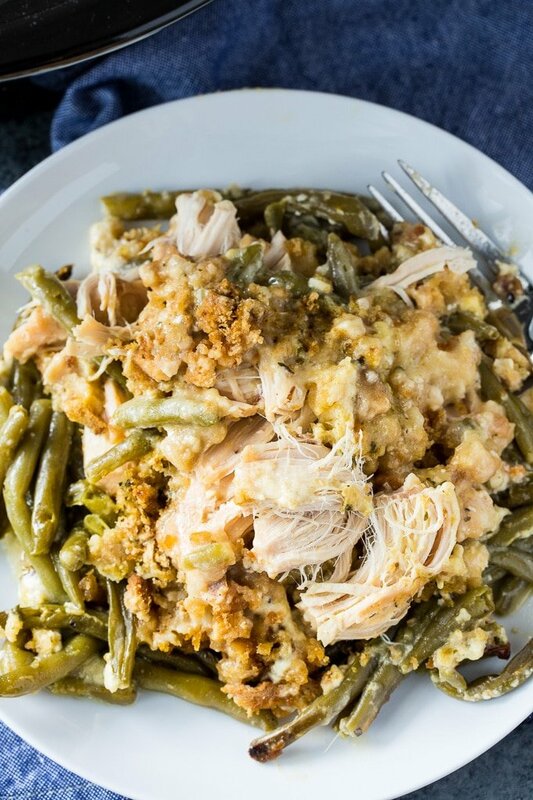 Crock Pot Chicken and Stuffing with Green Beans only takes a few minutes to prep and 4 hours in the slow cooker. Season chicken with seasoned salt and pepper. Place chicken in the bottom of a lightly greased 6-quart slow cooker. Pour dry stuffing mix on top of chicken. In a medium bowl, whisk together sour cream, mayonnaise, soup, and water. Pour on top of stuffing mix, spreading it evenly. Cover crock pot and cook on HIGH for 4 1/2 hours. 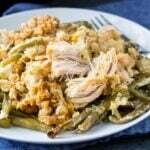 This entry was posted in Casseroles, Main Dishes, Slow Cooker and tagged chicken, crockpot recipes, green beans, poultry. Bookmark the permalink. Can this be baked in oven and how long? Do you use the seasoning packet of the stuffing mix? The stovetop stuffing I use has the seasoning already mixed in, but yes, I would add it. Can you use rotisserie chicken as a shortcut. Would the cooking time be the same? I want to make this recipe but with 6 chicken breast. Would the cooking time need to increase? And if so, by how much time? You can use the same cooking time for 6 breasts. This was delicious!! I did add a bit more liquid since I made it in my Nesco which is metal but used the slow cook setting. Used 1 cup sour cream and no mayo. Loved the flavor of the whole dish, the ease of making it and will definitely make this again. The chicken was so moist!! Excellent recipe. I’m planning on making this recipe this week. Curious if you sprinkled the seasoning packet that comes with the Stovetop stuffing on the chicken or the dry stuffing cubes? I suppose it doesn’t matter but wanted to make it like you did since it looks so darn good! Thank you. I have Pepperidge farm stuffing mix in a bag can I use that? In the picture the chicken looks very dry. Is it? Can I do low for 8 hours?